Overall, this level was better than your first level, but still had several mistakes. It was sort of fun. Difficulty: Extreme Easy --- Somewhat challengingish (especially the bossfight), but stamina mode and powerups. Btw, the checkpoint was unnecessary since the level was so short and there were some blind jumps. much better than your first level seeing how that one went, it had a decent size but still felt a bit, and the checkpoint wasnt nescecary in all honesty. the tiling was done pretty well, no troubles there, my only complaint in that section would be the fact the leaves felt really odd to play with due to their scrolling up and down with your screen. 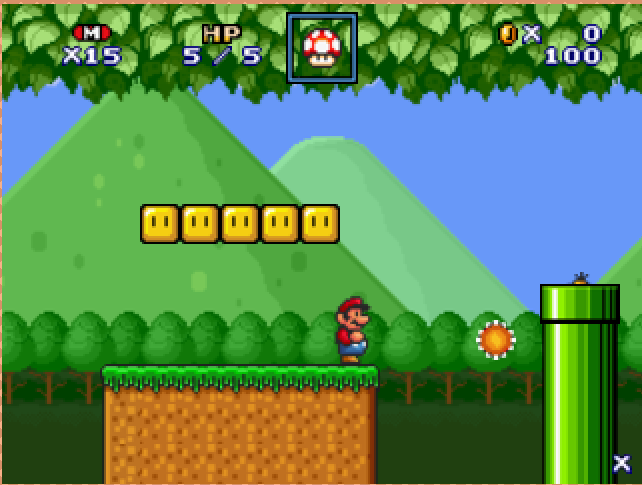 the gameplay in this level was quite dull and short, the challenges were pretty much not there throughot the whole level and enemies could simply be ignored as being in the level, and the lakitu also had improper placement as jumping on it would still show him onscreen due to them not stopping their fall. Also: the fact you enabled hp mode made the gameplay even more boring for the fact there literally was no sense of punsihment for rushing though everything, taking the most stupid hits in the progress. the bossfight was pretty dull and simple, there wasnt a real twist to it and well... just another generic boomboom fight. the level in itself was decent however, so i'll grade you accordingly for that. copy the code and paste it into a document app, go to the 5th number in the code after the text and set the 5th number to 0, then copy the document-created code and paste it into SMF3's code. A tree appeared out of nowhere and left again at the checkpoint area. There's a cut-off at the pipe to the boss arena. And you can get stuck on a small platform near the mushroom area, and your only choice is to fall off the ledge. But this level was still pretty decent, good job. Also, try adding some bushes or something on the ground to make the level look better.